Curry spiced cream corn brings up the flavor of the fillings. You can arrange it with vegetables of your choice. You can substitute salmon with bacon! 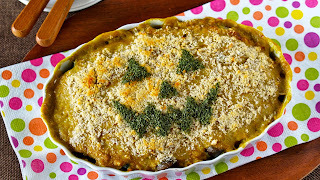 If you use Christmas stencil, you can make the gratin for Christmas! 1. Microwave frozen spinach as directed on its package until fully defrosted. 2. Slice the onion. Remove tough base of Shimeji mushrooms and break into bite-sized chunks. Chop salmon into chunks and season with salt and pepper. Place them on a microwavable dish, cover, and microwave at 500w for 3 minutes. Leave to cool for 5 minutes. 3. Put 1 and 2 (removing any bones and skin of salmon if any) in a bowl. Then toss with sesame oil, salt, and pepper. 4. Place 3 in a pie dish. Mix A very well and pour it on top. Sprinkle with bread crumbs and grated parmesan cheese. Bake in the oven or toaster oven for 10 minutes until the top is golden. 5. Sprinkle with parsley flakes. Use Halloween or Christmas stencil to create a cute pattern!